Human Optics, a German company, has recently launched a new artificial iris, named the ArtificialIris (Customflex in USA). This is a silicone devise that can be implanted inside the eye through a tiny 3.0 mm surgical incision. 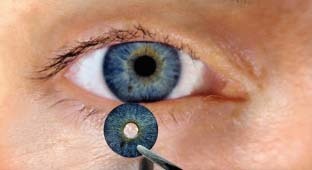 Each implant is unique in that it is custom made for the individual patient and hand painted based on a photograph of the fellow eye. Candidates for artificial iris implants are patients who have sustained trauma to the eye and patients with congenital aniridia. 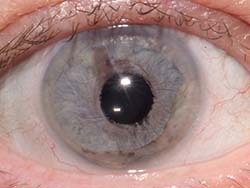 The damaged iris may distort the pupil causing severe functional disability from glare and haloes. If adequate tissue is present, the iris and pupil can be surgically reconstructed with sutures. In cases where there is excessive loss of issue due to trauma, the Human Optics ArtificialIris (Customflex) may be used to recreate the iris and pupil. 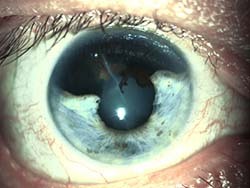 Preoperative photograph showing corneal scar and traumatic loss of superior half of the natural iris tissue. Post-operative photograph following artificial iris implant surgery (implant is placed behind remains of natural iris). Mr. Srinivasan has become the first eye surgeon in Scotland to implant the new custom-made ArtificialIris (Customflex) devise. He has many years of experience in reconstructing the iris and pupil both using sutures and artificial iris devises. Mr. Srinivasan serves as a teaching faculty in a instruction course at the annual meeting of the American Academy of Ophthalmology and at the European Society of Cataract and Refractive Surgery where he and his international colleagues teach other doctors on how to use these devises. Functioning much the same as the aperture of a camera, the iris controls the amount of light that enters the eye. The light goes through an opening called the pupil at the center of the iris. 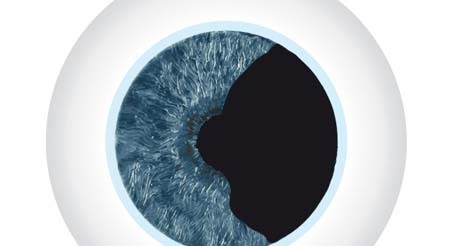 To control the amount of light entering the eye, the iris reduces the diameter of the pupil under brighter light conditions and enlarges the pupil when in darkness. In this manner, contrasts between bright and dark objects can be well perceived. 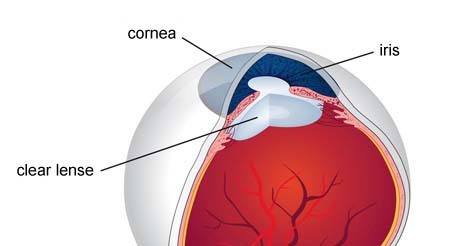 The size of the pupil also influences the depth of focus. The depth of focus allows a person to clearly see close and distant objects at the same time. Aniridia is the condition of a complete or partial absence of the iris. Some babies are born with missing or defective irises. In addition, pointed objects and corrosive chemicals cause hundreds of thousands of eye injuries annually in Scotland. Regardless of congenital or traumatic aniridia, both groups suffer from severe visual impairment. Light enters these eyes almost unhindered causing tremendous glare even in average daylight. Depth of field is reduced and contrast is perceived less. Then there is the cosmetic aspect, one of the biggest issues facing people with aniridia, as other people often react in a strange way to a deformed or missing iris.